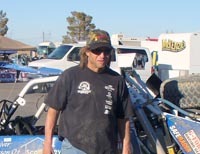 Hailey's Paul Robinson is 54, but he's eligible for "Rookie of the Year" on the Southern Nevada Off-Road Enthusiasts (SNORE) circuit since he has raced in Mexico for years. Robinson had his first driving start in the U.S. at SNORE's Dusty Times Battle of Primm (Nev.) over the Feb. 25-26 weekend. The Primm races attracted an official starting field of 208 entries competing on a tightly wound 12.2-mile course 35 miles south of Las Vegas. Over two days, Robinson placed fifth in the Pro 9 Class. Robinson said, "I drove the car both days. Saturday, I had Scott Miley from Scott Miley Roofing as my navigator. We finished 10th out of 25 starting cars, less than three minutes out of first place with a time of 1.07:51, averaging 45.9 mph. "Sunday, I put Javier Zamora in the navigator's seat. I put together a much better drive finishing third out of 20 starters in 1.11:29, at 43.3 mph. That gave us fifth overall for the weekend (2.19:21), six minutes behind the winner, Eric Muller from Ensenada, Mexico. "As a new team, in a new car and new class, we did really well. It was my first start in the U.S. after racing in Baja for the past eight years as a hired driver for three different teams. Down south we had a 75% podium success rate. "I expect to do the same up here in the states. Our next race is P.C.I. Race Radios 300 April 13-15 at Ridgecrest, Ca." Robinson's sponsors are Schaeffer's Racing Oils, Sun Valley Auto Club, Scott Miley Roofing, Sun Valley Transfer and Storage, Rocky Mountain Hardware, Parts Plus in Hailey, Byron's Welding, Grumpy's, Smith Optics, First Lite Clothing, Cabo Pulmo Beach Resort, Mike Mulligan Crane Service, Windy City Graphics and Woodside Motorsports.